Last school year started with an epic breakout of head lice at the school. I guess all the kids who went to summer camp brought it with them? Nevertheless, I went out and started arming myself just in case. I got head lice twice as a child, so I know what that itching and trouble is like. I really didn't want to see it come into our home, so I started looking into how I could possibly prevent it. 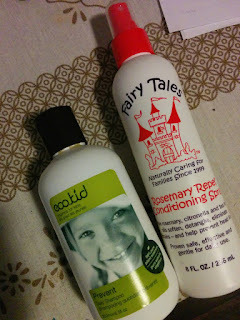 In addition to going to the pharmacy and getting a medical treatment shampoo and lice comb to have on hand just in case, I also found some products that might deter lice from ever setting up home. First I found Fairy Tales Repel Conditioning Spray . I had made my own essential oil blend originally, but it smelled kinda funky. I'm happy I bought this one because it smells really nice. I sprayed the boy's head every day before he left for school, as well as all his hats and hoods. I use it on my own hair as well, and I like the level of conditioning. It makes my hair very soft (and I have course, frizzy hair). I then switched all of us to Eco.Kid Prevent Shampoo . It smells like lemons, yet still seems very mild. I like the fact both products are made with essential oils and not strong chemicals. Well, we didn't get lice, so whether that was just luck or the products, I can't say, but it did give me peace of mind. I think for that it was worth it, as well as the fact they both smell really nice and the boy didn't have any problems with them.